I used 2 SNSS digi images for this card. First I printed the Cocoa's Baseball Cap image and colored it to match the Moments dsp. Then I printed the Super Dad digi image, colored it, hand cut and popped it up on foam tape. I added a SU! punched border along with some Pizzazz Aplenty navy ribbon, and 4 sparkly brads and called this one done! I think I may need a new camera because all my photos seem a tad out of focus regardless of what I do. I may have the settings wrong too - if anyone can give me any helpful tips, I'd appreciate it! In the meantime, if you click the photo you'll see a more focused version. Thanks for stopping by and I wish you all a wonderful Tuesday! 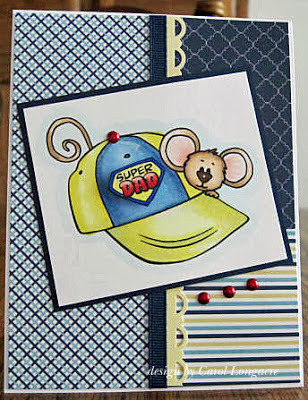 Super cute card for a super dad! I LOVE, LOVE, LOVE that DP you used!!!! Perfect for a guy! Now, on to Cocoa......Precious! What a little guy he is (and perfect coloring too). Love your card! Camera.......your photo really looks just fine to me. I wouldn't even know how to help as I'm basically a point and shoot type person. What a perfect card for Fathers Day! Love the colours you have chosen and the image which you have coloured so well - a gorgeous card Carol. 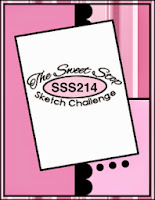 Thanks so much for sharing with us at the Sweet Stop this week. Ditto what Lynn said. I love this card and how you thought to do the SuperDad image and put in on the cap. Great papers and the brads really pop out on this one. Like Lynn I am a point and shoot but to me this photo looks perfect. Raining to beat the band right now. Had to work today and have to again Friday. The rest of the week is just as busy. Hope I can find the time and energy to make a card here and there. Very cute, Carol! Perfect papers and image for a wonderful Father's Day card! As for the photography, your picture looks fine. I'm basically a point and shoot person as well, but I do have a small light box studio and use the auto focus or the close-up setting with no flash. Hugs! Very cute card...just perfect for Father's day. Your pic looks fine to me. Jill <---who is NOT an expert on photography or computers...smile..